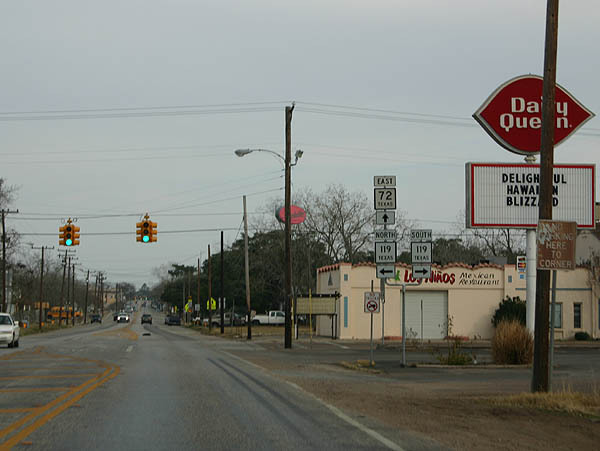 SH 72 travels across the agricultural areas of South Texas, connecting several small towns. 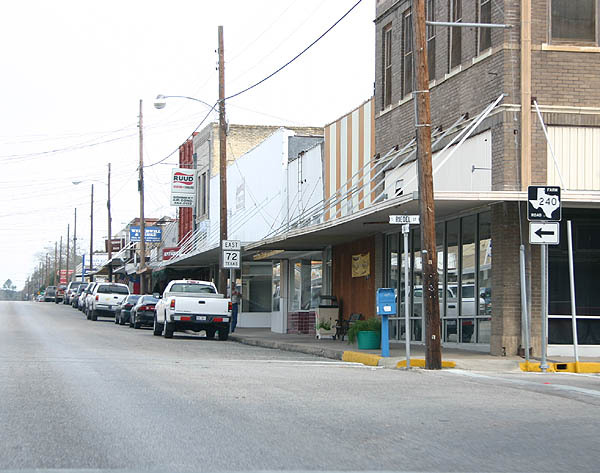 Beginning in Cuero, a former wild west outpost but now a farming community, SH 72 travels southeast through Yorktown and Runge before arriving in Kenedy, the largest city on the route. 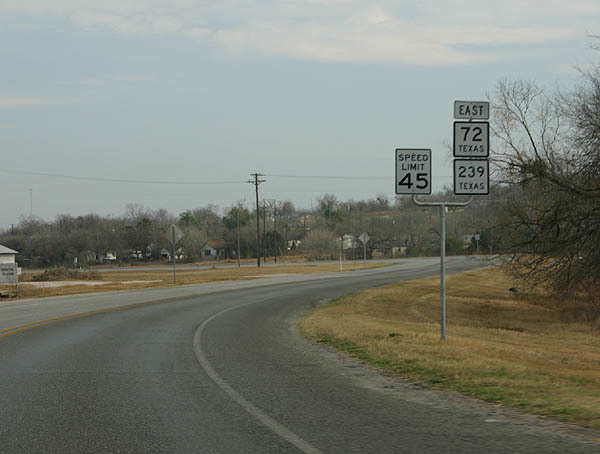 SH 72 continues southeast over farm fields to cross IH 37 and meet US 281 in Three Rivers. Leaving Three Rivers to the west, IH 37 passes Choke Canyon Reservoir and the town of Calliham before reaching the town of Tilden. West of Tilden, SH 72 ends at SH 97 near Fowlerton. 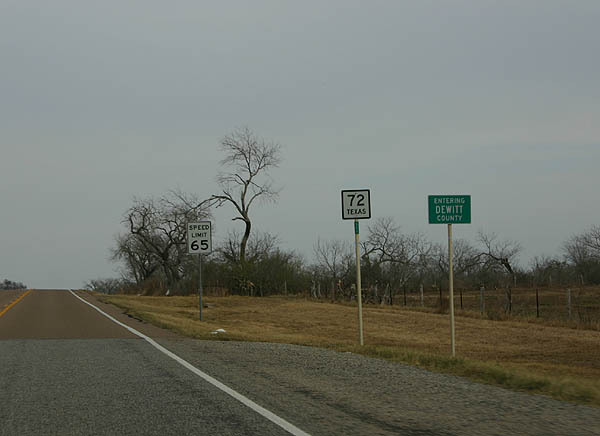 SH 72 was designated in 1939 on the present-day route, continuing to Cotulla. 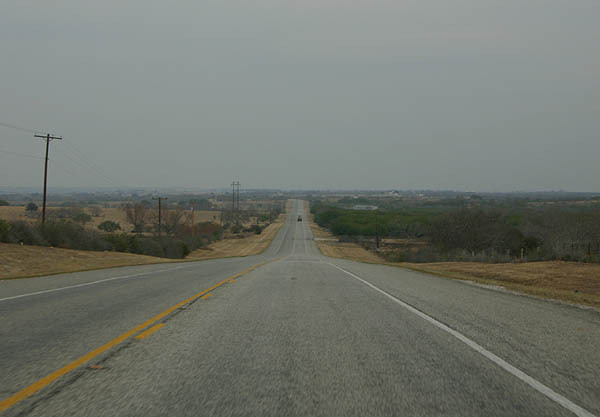 West of Three Rivers, the dirt road to Fowlerton was removed from the state highway system in 1942, while the road between Fowlerton and Cotulla was transferred to SH 97. In 1961, FM 63 was added to the route, re-adding the mileage between Three Rivers and Fowlerton. The road is two lanes for its entire length. 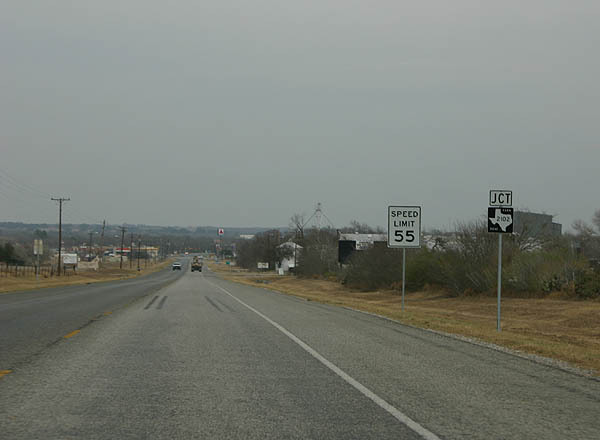 FM 1358 travels southeast to Karon, then west to IH 37. Photo taken January 4, 2006. 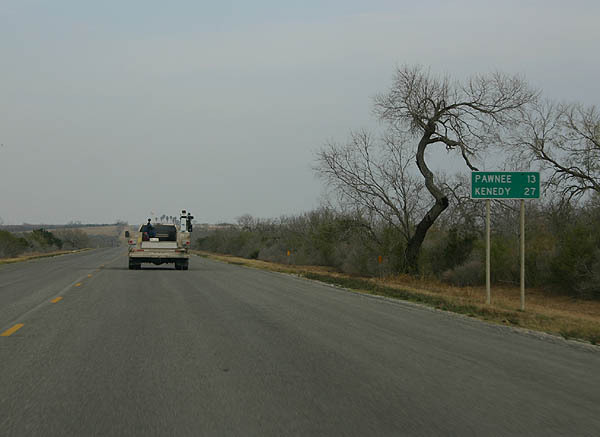 Distance sign to the towns of Pawnee and Kenedy. Photo taken January 4, 2006. 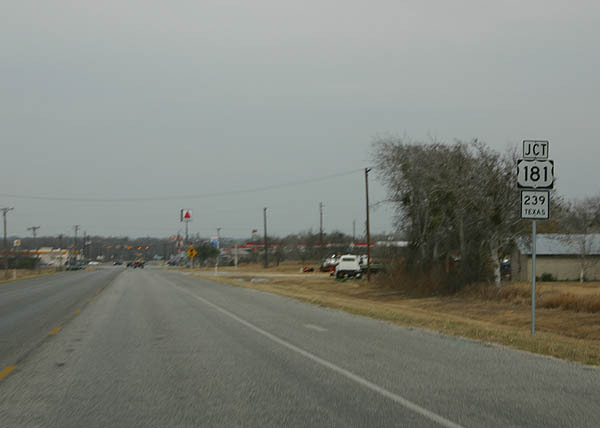 FM 2049 begins at US 281 near Suniland and travels southeast to reach SH 72 here. Photo taken January 4, 2006. 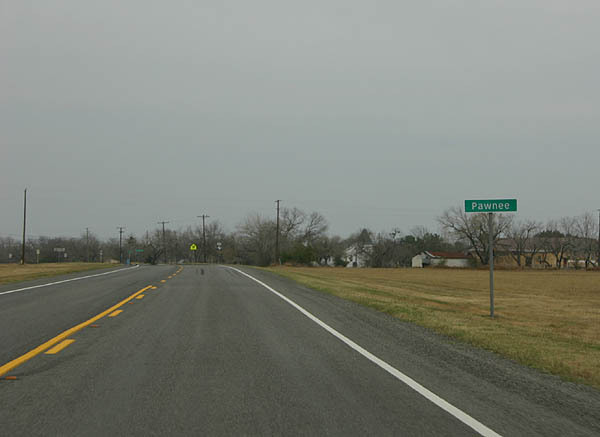 Approaching Pawnee, travelers find FM 673, which travels southeast to meet US 59 in Beeville. Photo taken January 4, 2006. After FM 673, a typical shield assembly for SH 72 appears. SH 72 is a designated Hurricane Evacuation route. Photo taken January 4, 2006. 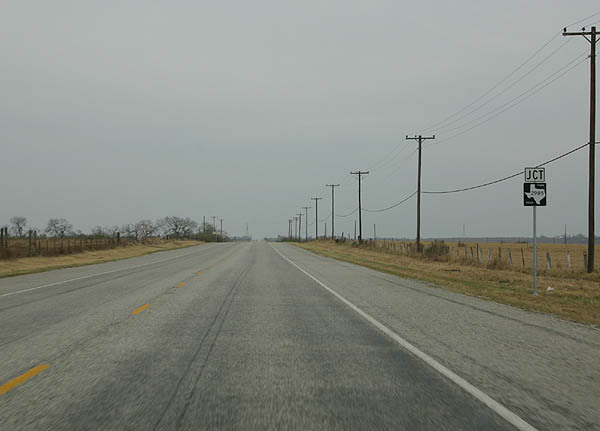 This is a view of the two-lane highway as it winds through northwest Bee County. Photo taken January 4, 2006. Pawnee is a small town, reportedly named after a board nailed to a tree that said Pawnee, which itself was a reference to the Pawnee Indian tribe. Photo taken January 4, 2006. 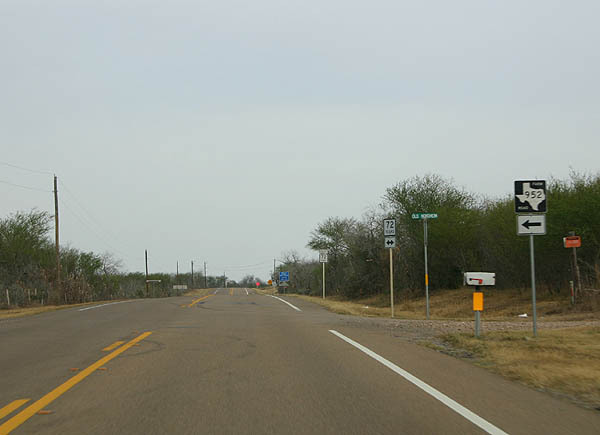 FM 798 travels east from US 181 at Tulsita. Photo taken January 4, 2006. 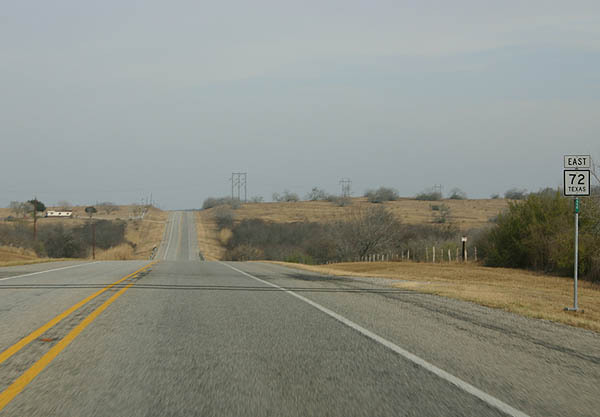 FM 882 travels via Nell to FM 626 near El Oso. Photo taken January 4, 2006. 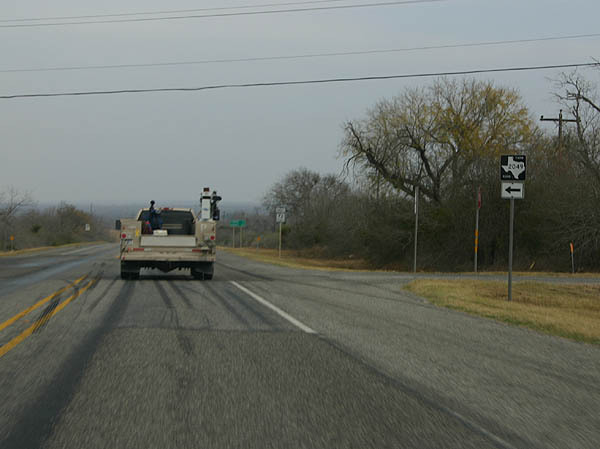 Entering Karnes County, travelers find FM 626. 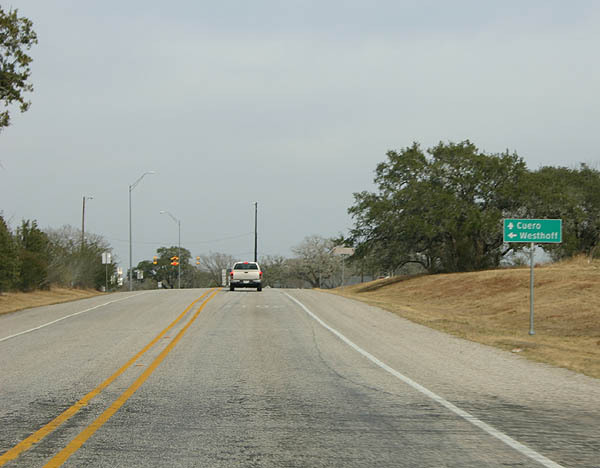 FM 626 begins at FM 99 and travels via Lenz, El Oso, and Zunkerville to SH 72. Photo taken January 4, 2006. 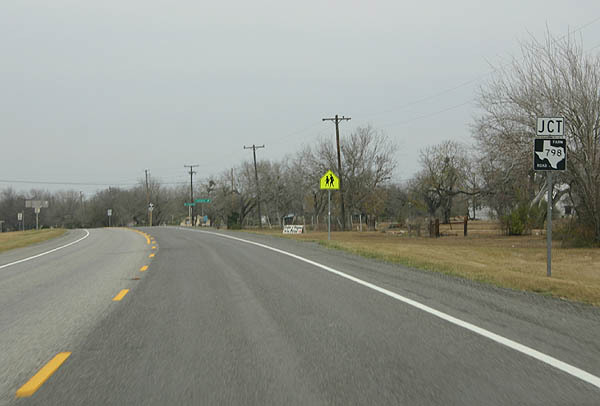 FM 2985 begins at FM 798 near Caesar, traveling via Monteola to SH 72. Photo taken January 4, 2006. SH 72 crosses pasturelands, dotted by Live Oaks, on the way to Kenedy. Photo taken January 4, 2006. 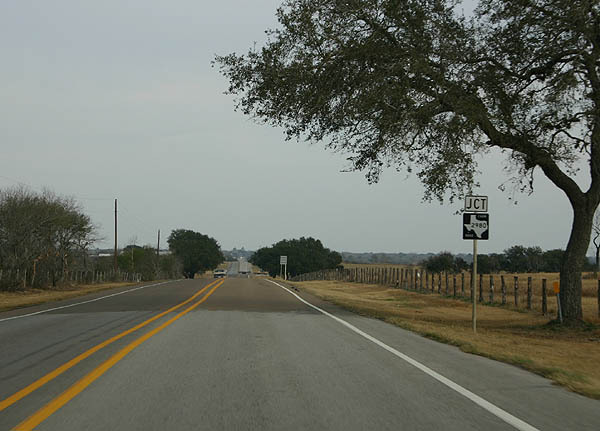 Approaching Kenedy, FM 1145 connects US 181 and SH 72. Photo taken January 4, 2006. 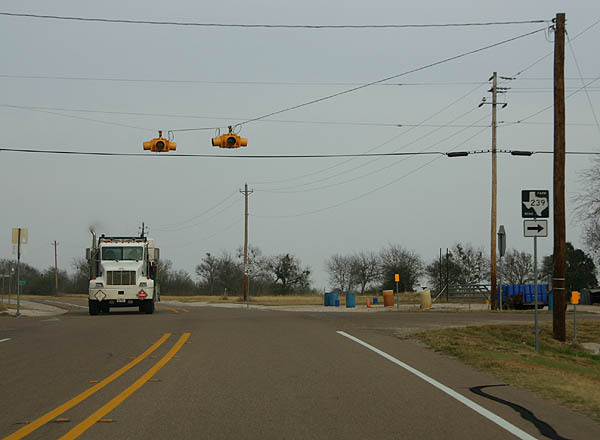 FM 2102 connects Kenedy and FM 626 near Lenz, continuing west after Lenz to FM 99. Photo taken January 4, 2006. 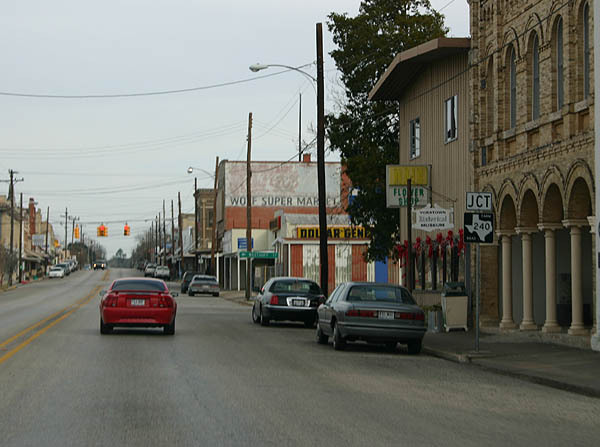 Kenedy is the second-largest town along SH 72, a railroad junction named after the original anglo owner of the land. In the early 1900s, Kenedy was known for its gunfights that led to the nickname Six-Shooter Junction. Today, the town holds a Bluebonnet festival in April. SH 72 approaches SH 239 and US 181 here. Photo taken January 4, 2006. 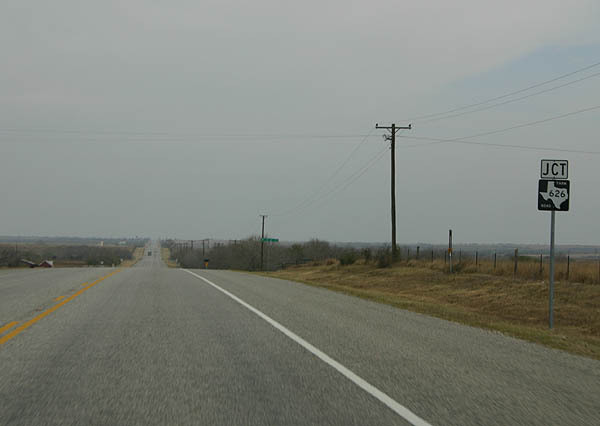 US 181 was once the primary road between San Antonio and Corpus Christi, but has since been superceded by IH 37. The truck bypass is signed to avoid the central business district. Photo taken January 4, 2006. 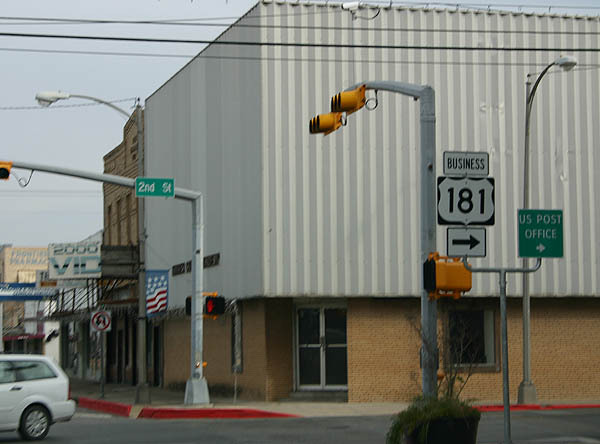 There are actually two segments of Business US Highway 181. 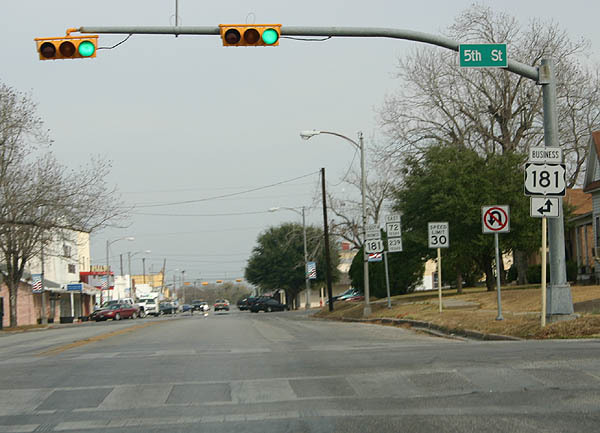 BU 181-F runs north from this intersection (5th and Main streets) to US 181. Photo taken January 4, 2006. 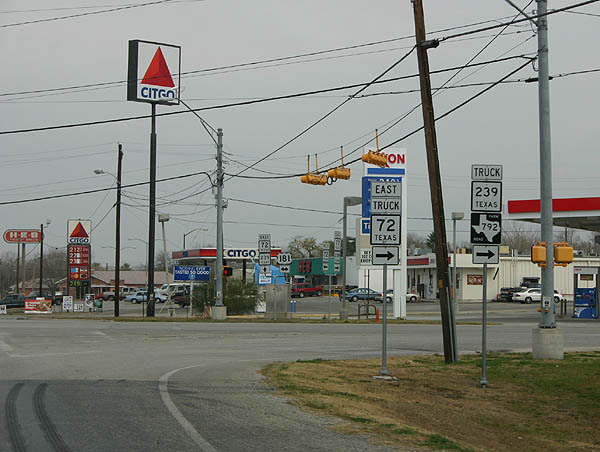 This sign assembly shows the triple overlap through Kenedy of Business US 181, SH 72 and SH 239. Photo taken January 4, 2006. BU 181-G (notice the change in designator) travels south along 2nd street, at the next intersection, to meet US 181 on the south side of Kenedy. Photo taken January 4, 2006. Departing Kenedy, SH 72 and SH 239 continue their short overlap. Photo taken January 4, 2006. 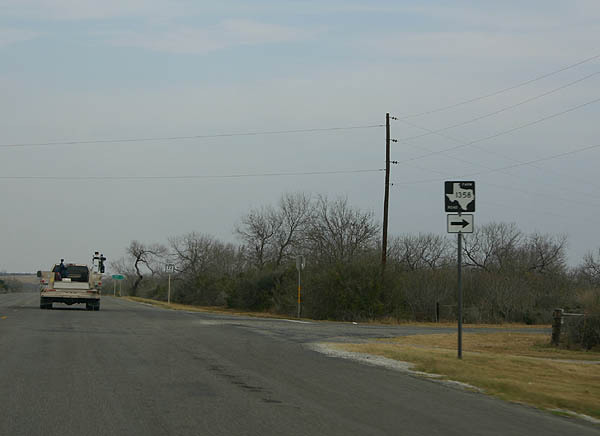 SH 239 departs from SH 72 here, to travel southeast to Goliad, eventually ending in Austwell. Photo taken January 4, 2006. East of Kenedy, the land returns to its scrubby nature. Photo taken January 4, 2006. 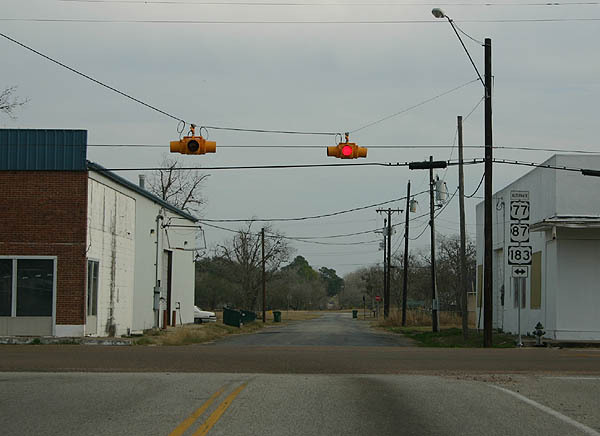 Runge is a small, staunchly Polish town, reflecting the ethnic character of immigrants to Texas. Photo taken January 4, 2006. 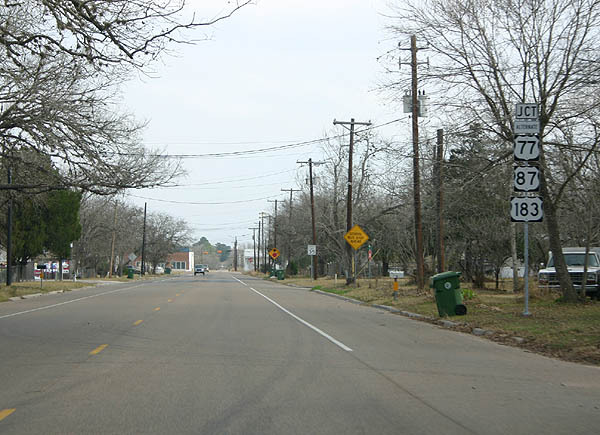 Inside Runge, SH 72 meets FM 81, which begins at Charco and travels to Hobson. Photo taken January 4, 2006. Approaching Nordheim, FM 239 serves local farms. Nordheim is a small German community established in 1895 as a railroad siding. Photo taken January 4, 2006. Leaving Nordheim, this view shows the characteristic flat terrain between Nordheim and Yorktown. 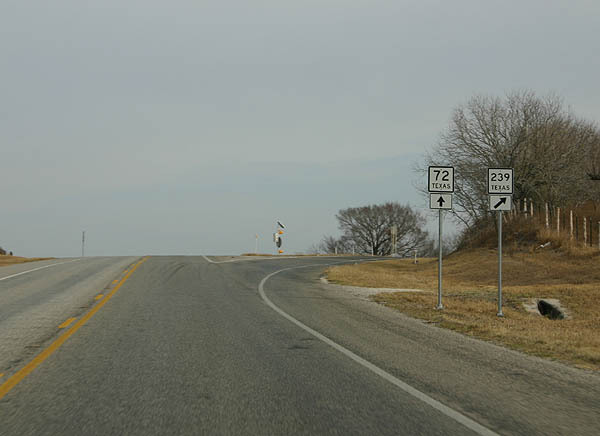 SH 72 enters Dewitt County in this picture. Photo taken January 4, 2006. FM 952 serves local farms, traveling approximately 6.5 miles. Photo taken January 4, 2006. 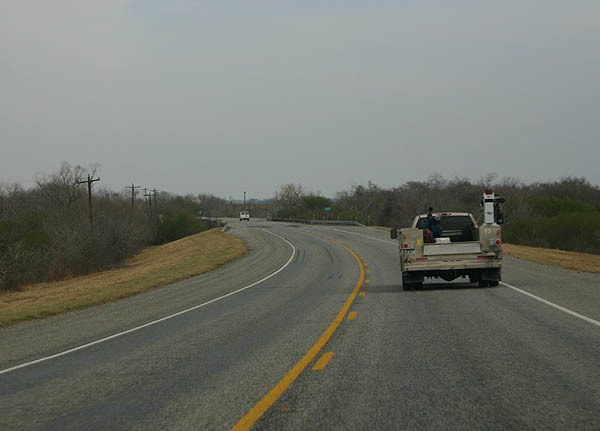 FM 2980 begins north of SH 72 and travels to Smith Creek. Many of the FM roads in this area do not connect to other roads, but serve local traffic. Photo taken January 4, 2006. Approaching Yorktown, travelers find SH 119. 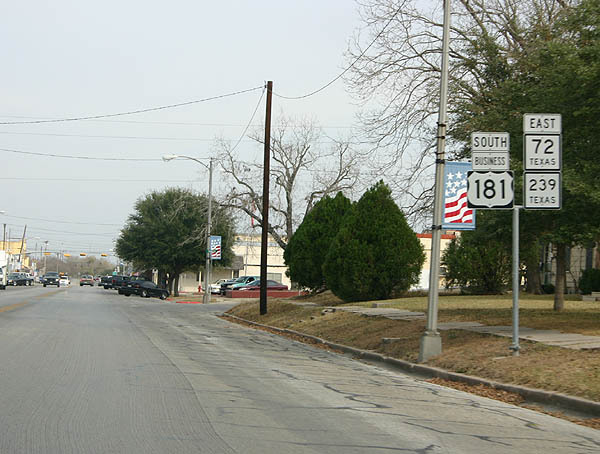 SH 119 begins at Stockdale and travels toward Goliad. Photo taken January 4, 2006. 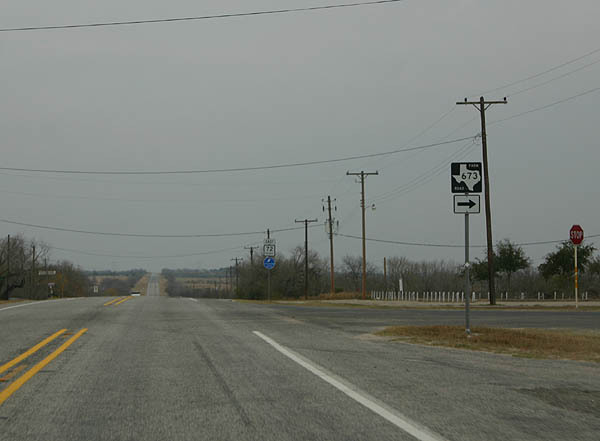 FM 237 connects SH 72 and FM 236 near Mission Valley. Photo taken January 4, 2006. Yorktown was established on land owned by Captain John York, along a route he built between Indianola and San Antonio. 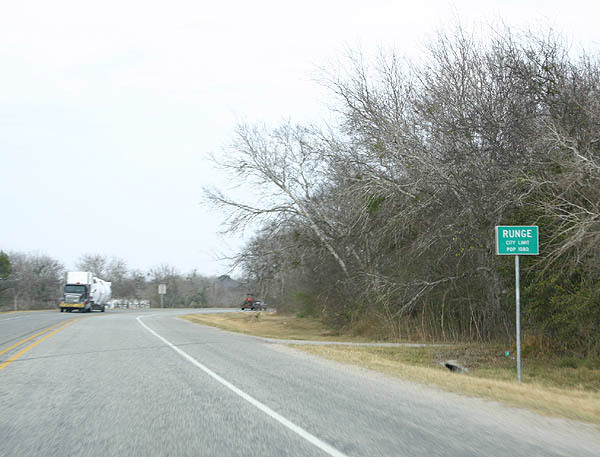 This road, the Old Indianola Trail, was used by German Immigrants to settle South Texas. Yorktown is one of the oldest towns in South Texas, dating back to 1854, and has a large meadow-like commons area in the middle of town, rather than a Texas-style town plaza. Photo taken January 4, 2006. 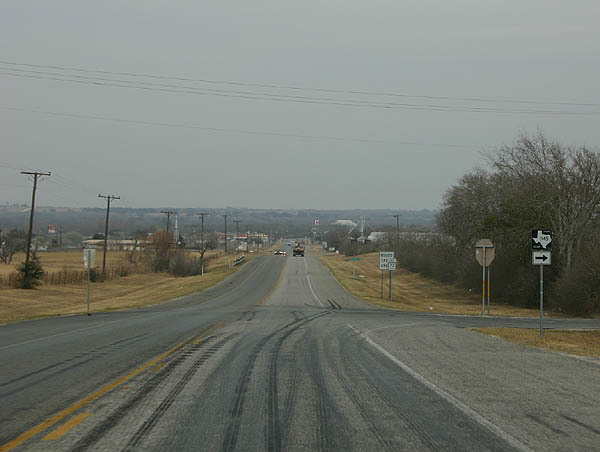 FM 240 connects Westhoff (at US 87) and Yorktown (at SH 72). Photo taken January 4, 2006. 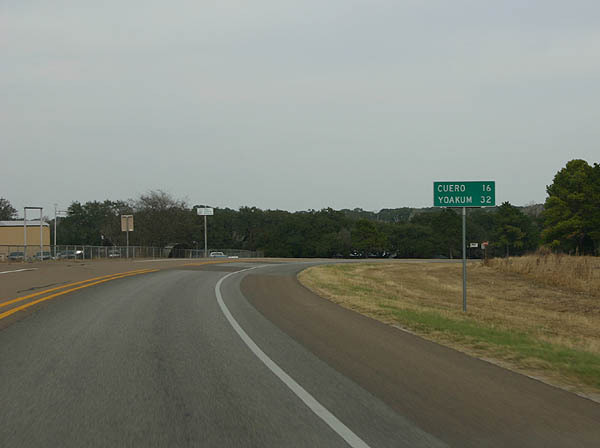 Leaving Yorktown, motorists see this distance sign to Cuero (SH 72) and Yoakum (on US 77A). Photo taken January 4, 2006. Use US 87 to reach Westhoff. 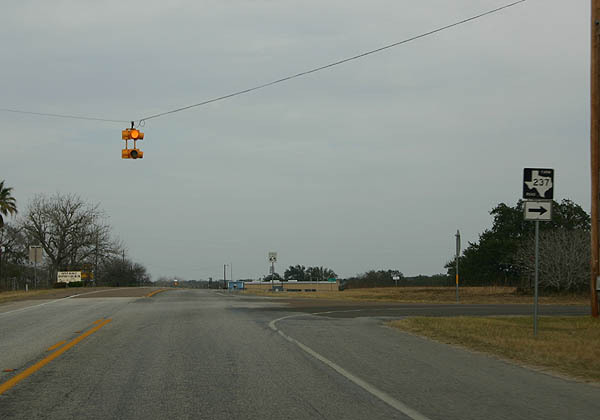 US 87 paralells SH 72 between this junction and Cuero. Photo taken January 4, 2006. 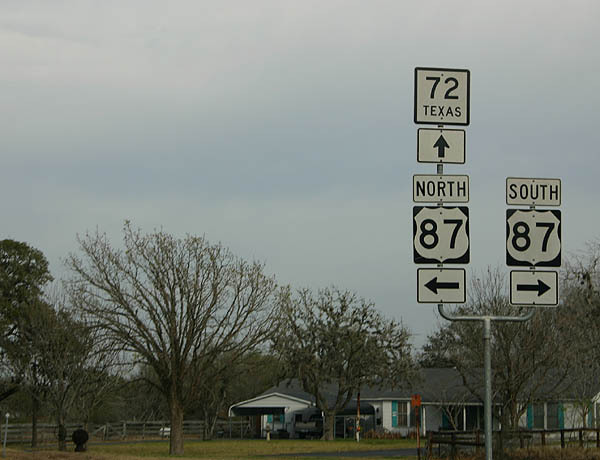 SH 72 crosses US 87 here. 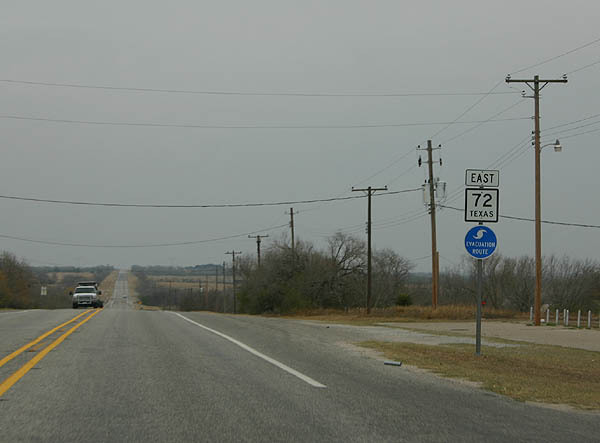 SH 72 used to end at US 87 but was later extended to Cuero. Photo taken January 4, 2006. 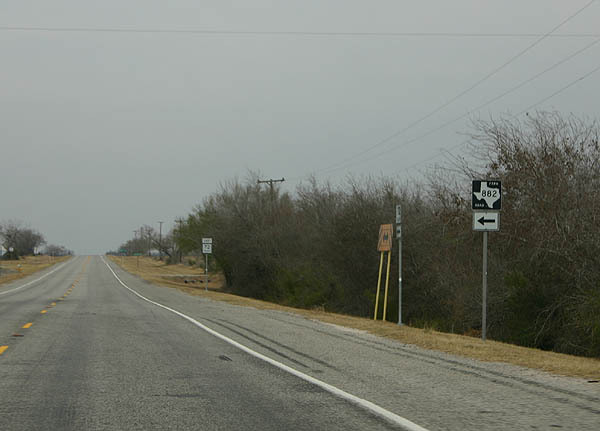 Approaching Cuero, the final juction along SH 72 is US 77 Alternate/US 87/US 183. Photo taken January 4, 2006. 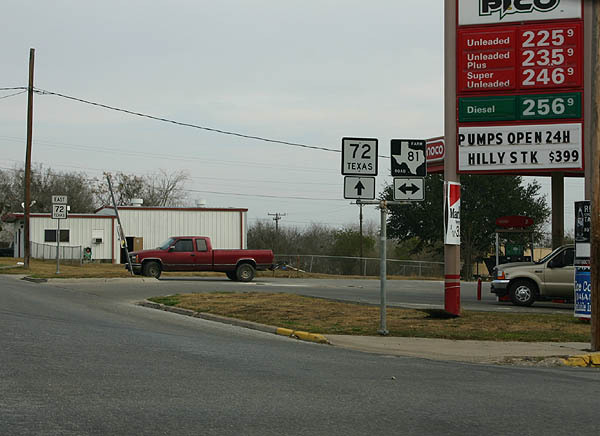 This is the end of SH 72, at Alternate US 77/US 183. Photo taken January 4, 2006. Page Updated February 7, 2006.